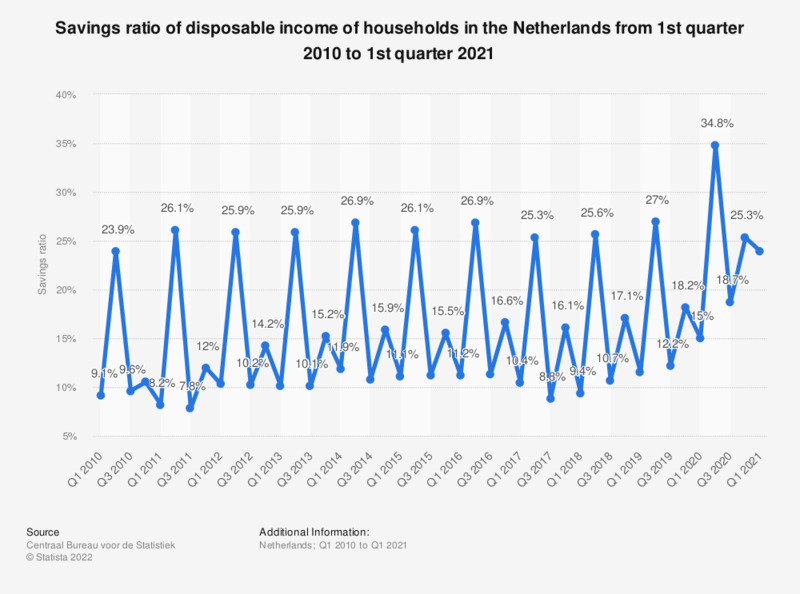 This statistic shows the savings ratio of disposable income of households in the Netherlands from the first quarter of 2010 to the first quarter of 2018. In the first quarter of 2018, the savings ratio was approximately 7.5 percent. * All numbers provided are provisional. According to the source "the savings ratio equals the gross disposable income, adjusted for the net equity in pension funds reserves, minus the consumption expenditure divided by the gross disposable income, adjusted for the net equity in pension funds reserves". The source states that "the sector households includes all natural persons who are resident for more than one year in the Netherlands, irrespective of their nationality. On the other hand Dutch citizens who stay abroad for longer than one year do not belong to the Dutch sector households". Also, it includes non-profit institutions serving households (NPISH), such as religious organizations, charity organizations, political parties, trade unions and cultural, sports and recreational organizations. Thinking of prescriptions filled over the past year, approximately what was the total dollar amount your household has had to pay yourselves?